I admit it — I’m a design junkie. I watch all the kitchen design shows, follow Houzz, Kitchn and TinyHouse, and regularly attend the Minneapolis/St. Paul Home Tour. I have a Pinterest page where I collect images of kitchen efficiency and kitchen remodeling. Function and aesthetics are the two most common reasons that propel people into the formidable undertaking of a kitchen remodel. But energy is at the center of a kitchen’s function, not counter tops or traffic flow. Few and far between are the videos and articles in the design arena that look at energy efficiency and nothing I found gave any consideration to our energy future. About half of Minnesota’s electricity is generated from coal-burning plants, two of which (the Sherco plants) are the largest source of soot and carbon pollution in our state. We didn’t want to be supporting that kind of electricity production so a number of years ago we opted to enroll in Xcel’s Windsource program to encourage the development of wind power. Two years ago we added solar PV panels, which provide most of our power for 9 months of the year (when not covered in snow). When our house was built in 1921, it had two – count ’em – two electric outlets in the kitchen! We added a third so we could put the refrigerator IN the kitchen, rather than on the back landing. Now, modern building codes ensure you can plug in every so many feet. 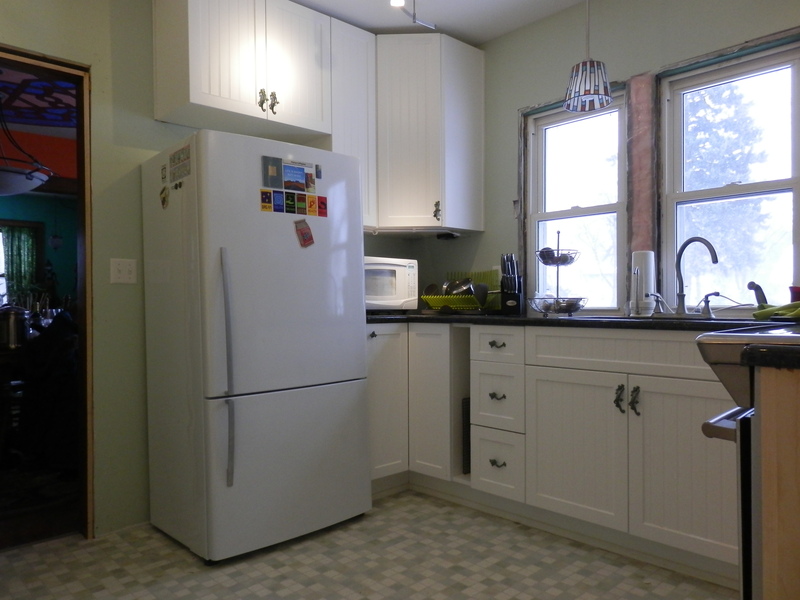 Our new 10′ x 10′ kitchen boasts eight outlets and two hard-wired units (stove and water heater). How much would the new kitchen add to our electric load? Could we actually reduce our usage? Lighting: Originally we had one wall-mount fixture in the middle of the room that would hold three 60-watt incandescent bulbs (180 watts). Of course, it could never really do the job because we were always working in our own shadow. One easy lighting fix was to move the sink and to add countertop in front of the window so we’d have natural light in the right places during the day. Overhead we installed two LED track lights with five lights in each, using a total of 100 watts when they are both on. (Creative Lighting sale room.) We put them on two separate switches so we can use just one track for walking through the room, or both tracks if we’re going to be working in the kitchen. 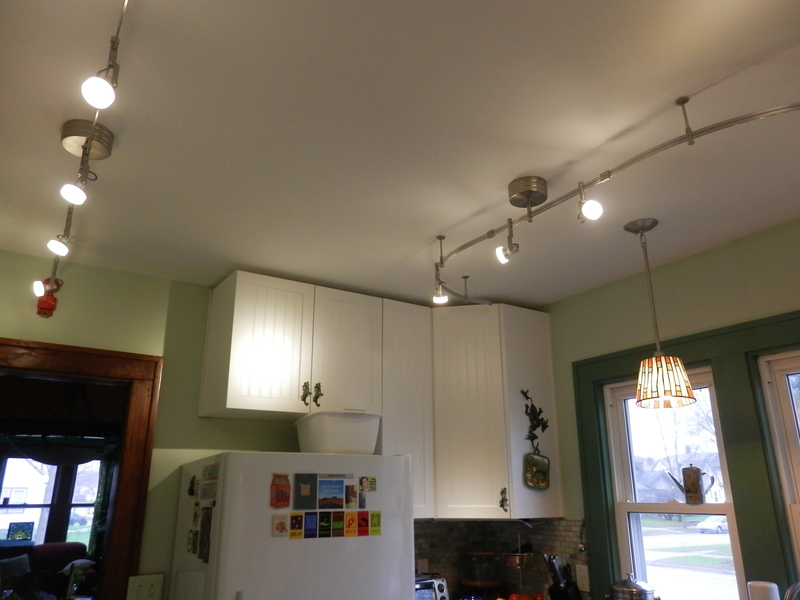 LED task lighting is only used when needed: a cheap undercounter strip from Menards, a decorative fixture over the sink (another sale room piece), and lights in the vent hood. What we learned: We originally purchased a halogen track light system. The sales person told us we could switch out the halogen bulbs for LED bulbs. When our electrician came to install the light, he pointed out that the manufacturer had a label inside the fixture that specifically said only halogen bulbs should be used in that fixture. These technologies are not interchangeable and there could be a risk of fire. He strongly advised us to return it and get one specifically meant for LED (which is more expensive). We did. He also advised us to buy a few extra light units in case one or more of the existing lights went bad in the years ahead. Manufacturers come and go, especially those in China, so it may not be possible to get extras in future. 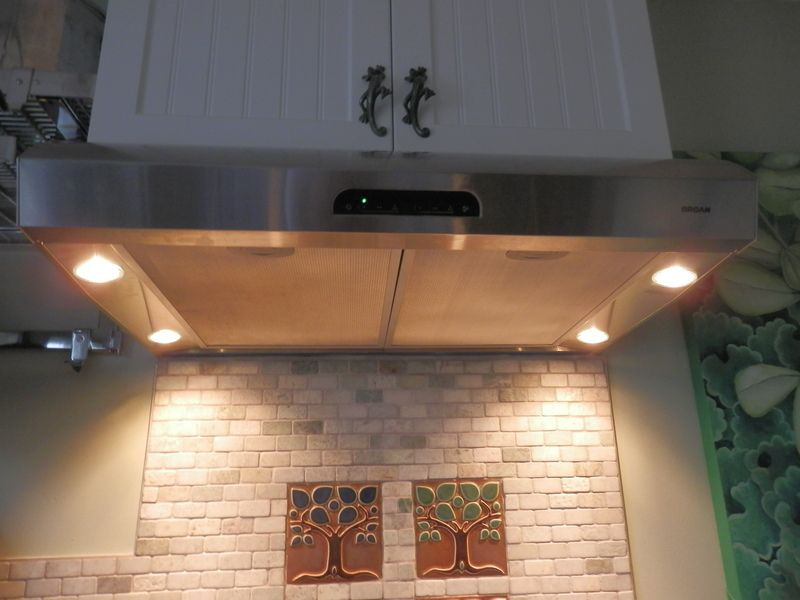 Vent hood with LED lights and washable screens. Venting: We had nowhere to go but up when it came to this kitchen problem. As I said in a previous post, our old vent was a hole in the wall with a fan in it and a thin piece of tin covering it. It was on the opposite side of the room from the stove. You pulled a chain and the tin opened up and the fan started. Now we have a vent located above the stove. It’s well insulated so no cold air enters the kitchen. We chose a modestly priced model, but one with LED lights. Dishwashing: Away it went. This kitchen is soooo small, it was just taking up valuable space. We no longer have kids at home; we’re a household of adults who can stay on top of our own dishes. If we needed one, we’ll consider a countertop dishwasher. Refrigeration: Stick with us here–we took a very broad look at our options. Refrigerators have an expected lifespan of 14 years so we considered not only our space needs but also what we expect our city’s and state’s energy future to look like. We were strongly leaning toward under-counter refrigeration. Between doors and windows, there’s barely room to fit a fridge and most refrigerators are so deep they would dominate the room. An under-counter fridge would be ideal and would give us much desired countertop space. But we have aging-in-place goals that include not having to get down on our hands and knees to get things from low places so a short fridge with doors would not fit the bill. Refrigerator drawers would be ideal, but we had to get real. Nice refrigerator drawers are very expensive. The models we could afford (on sale) were quite small, had only a partial bottom drawer, and when we compared the cost to run two of them (10 cubic feet of space) against the cost of operating a regular-sized fridge (this information is on the sales label), they turned out to be more expensive in every way. We also gave some thought to a solar-powered fridge and the installation of a stand-alone solar panel on the side of the house specifically to run it. The cost is high and the size options are few but it would give us more control over meeting our refrigeration needs should the grid in our area begin to experience difficulties in response to greater climate instability. Now we had to weigh what we thought would be a realistic future for the major metropolitan area in which we live, which has a reasonably well functioning electrical grid. Today, if power goes out, it’s more often the result of an ice storm, in which case we can put snow in a cooler to keep food cold until electricity comes back on. Climate change is certainly bringing hotter, more humid weather to our state so it is possible we could begin to experience brown outs and blackouts in summer, but a more cost-effective way to handle such a one-off occurrence would be a gas-powered generator for the freezer and eating up the refrigerator food. We choose a Fisher Paykel fridge. That manufacturer is known for environmentally friendly appliances. We’ve been very happy with our other Fisher Paykel appliances. We decided to bet that the power company and the electric grid is going to remain operational for at least as long as our refrigerator. We’ll review that decision in 2030. In the end we chose a 17.9 cubic foot cabinet-deep fridge with a bottom freezer. This configuration is the most energy efficient. Cooking … that leads to the next energy source, natural gas. I’ll also talk about the decision we made about heating water in a later post. This entry was posted in Climate Change/Science, Energy and tagged energy efficiency, LED lights, solar powered refrigerator. Bookmark the permalink.